Specimen collection numbers SCL 15371 (left) and SCL 15384 in the UBC Herbarium Algae Databse. Search the collection number in the database for more information on this specimen, or search the species for further occurrences. Images courtesy of Sandra Lindstrom. This red alga has long and thin cylindrical branches; it reaches 50 cm tall and only 2 mm wide. It is sparsely branched, often with small spiny branches around the bases of the main axes. Its colour is reddish-brown to brown. Carposporophytes form small bumps along the branches. Gracliaria species usually grow in the subtidal of sheltered shorelines. California limu is found from the mid intertidal to shallow subtidal of protected areas, and ranges from Alaska to northern Mexico. It commonly grows on rocks partially buried in mud. 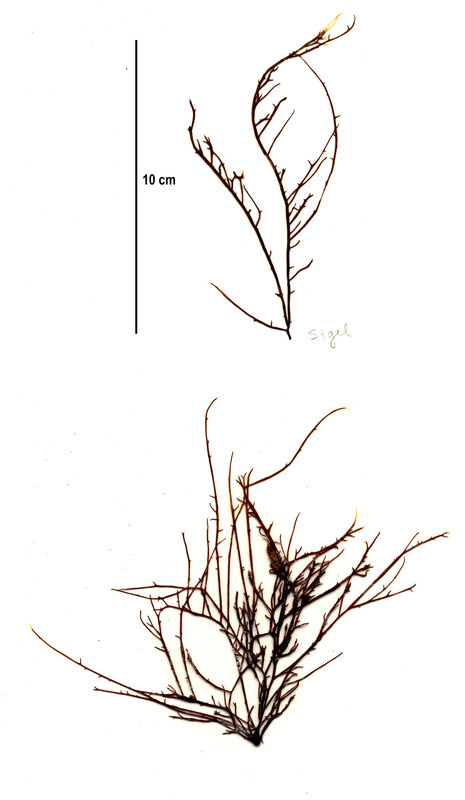 Species belonging to the Gracilariopsis and Gracilaria genera can be extremely difficult to differentiate and microscopic examination is usually required for a correct identification - though habitat can be helpful as the former is more commonly found in moderately exposed to exposed intertidal locations. 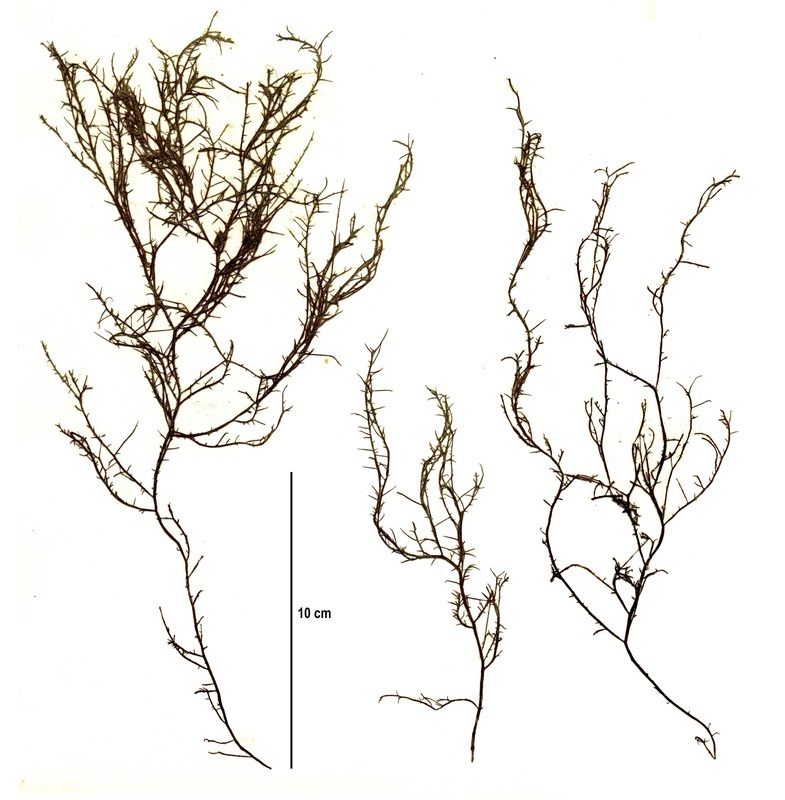 An example of a similar species also found on the Central Coast is sea spaghetti (Gracilariopsis andersonii), which reaches 2 m in length and grows in more exposed habitats. This species is edible, and is a source of the jelly-like thickening agent agar. O'Clair, R. and Lindstrom, S. Gracilaria pacifica Abbott 1985. In Klinkenberg, Brian. (Ed.). E-Flora BC: Electronic Atlas of the Plants of British Columbia. Lab for Advanced Spatial Analysis, Department of Geography, University of British Columbia, Vancouver. Accessed 08/06/2015.